Retire into yourself as much as you can. Associate with people who are likely to improve you. Welcome those whom you are capable of improving. The process is a mutual one: men learn as they teach. And there is no reason why any pride in advertising your talents abroad should lure you forward into the public eye, inducing you to give readings of your works or deliver lectures should be glad to see you doing that if what you had to offer them was suitable for the crowd I have been talking about: but the fact is, not one of them is really capable of understanding you. You might perhaps come across one here and there, but even they would need to be trained and developed by you to a point where they could grasp your teaching. ‘For whose benefit, then, did I learn it all?’ If it was for your own benefit that you learnt it you have no call to fear that your trouble may have been wasted. This is incorrect. There is no such thing as ‘peaceful stillness’ except where reason has lulled it to rest. Night does not remove our worries; it brings them to the surface. All it gives us is a change of anxieties. For even when people are asleep they have dreams as troubled as their days. The only true serenity is die one which represents the free development of a sound mind. Look at the man whose quest for sleep demands absolute quiet from his spacious house. To prevent any sound disturbing his ears every one of his host of slaves preserves total silence and those who come anywhere near him walk on tip-toe. My own advice to you – and not only in the present illness but in your whole life as well – is this: refuse to let the thought of death bother you: nothing is grim when we have escaped that fear. There are three upsetting things about any illness: the fear of dying the physical suffering and the interruption of our pleasures. I have said enough about the first, but will just say this, that the fear is due to the facts of nature, not of illness. Illness has actually given many people a new lease of life; the experience of being near to death has been their preservation. You will die not because you are sick but because you are alive. As Posidonius said, ‘In a single day there lies open to men of learning more than there ever does to the unenlightened in the longest of lifetimes.’ In the meantime ding tooth and nail to the following rule: not to give in to adversity, never to trust prosperity and always take full note of fortune’s habit of behaving just as she pleases, treating her as if she were actually going to do everything it is in her power to do. Whatever you have been expecting for some time comes as less of a shock. Why then do we give our sons a liberal education? Not because it can make them morally good but because it prepares the mind for the acquisition of moral values. Just as that grounding in grammar. as they called it in die old days, in which boys are given their elementary schooling, does not teach them the liberal arts but prepares the ground for knowledge of them in due course, so when it comes to character the liberal arts open the way to it rather than carry the personality all the way there. Philosophy has the single task of discovering the truth about the divine and human worlds. The religious conscience. the sense of duty, justice and all the rest of the close-knit. interdependent ‘company of virtues’, never leave her side. Philosophy has taught men to worship what is divine, to love what is human, telling us that with the gods belongs authority, and among human beings fellowship. That fellowship lasted for a long time intact, before men’s greed broke society up – and impoverished even those she had brought most riches; for people cease to possess everything as soon as they want everything for themselves. Death you’ll think of as the worst of all bad things, though in fact there s nothing bad about it at all except the thing which comes before it – the fear of it. You’ll be scared stiff by illusory as well as genuine dangers, haunted by imaginary alarms. What good will it do you to: Have found a route past all those Arrive forts And won escape right through the enemy’s lines? Peace itself will supply you with new fears. If your mind has once experienced the shocks of fright you’ll no longer have any confidence even in things which are perfectly safe; once it has acquired the habit of unthinking panic, it is incapable even of attending to its own self-preservation. For it runs away from dangers instead of taking steps to avert them, and we’re far more exposed to them once our backs are turned. More active and commendable still is the person who is waiting for the daylight and intercepts the first rays of the sun; shame on him who lies in bed dozing when the sun is high in the sky, whose waking hours commence in the middle of the day – and even this time, for a lot of people, is the equivalent of the small hours. There are some who invert the functions of day and night and do not separate eyelids leaden with the previous day’s carousal before night sets in. Their way of life, if not their geographical situation, resembles the state of those peoples whom nature as Virgil says, has planted beneath our feet on the opposite side of the world. How much better to pursue a straight course and eventually reach that destination where the things that are pleasant and the things that are honourable finally become. for you, the same. And we can achieve this if we realize that there are two classes of things attracting or repelling us. We are attracted by wealth, pleasures, good looks, political advancement and various other welcoming and enticing prospects: we are repelled by exertion, death, pain, disgrace and limited means. It follows that we need to train ourselves not to crave for the former and not to be afraid of the latter. A few years ago, I read The Five Dysfunctions of a Team and it remains to be, for me, one of the most practical and applicable management books. Patrick Lencioni, the author of that book, has published a number of other books which have received high reviews as well, and I decided to read one of his more recent ones The Advantage – Why Organizational Health Trumps Everything Else in Business. The single greatest advantage any company can achieve is organizational health. Yet it is ignored by most leaders even though it is simply free, and available to anyone who wants it. Sounds simple, so why is it that difficult? But before leaders can tap into the power of organizational health, they must humble themselves enough to overcome the three biases that prevent them from embracing it. The Sophistication Bias: Organizational health is so simple and accessible that many leaders have a hard time seeing it as a real opportunity for meaningful advantage…The Adrenaline Bias: Becoming a healthy organization takes a little time. Unfortunately, many of the leaders I’ve worked with suffer from a chronic case of adrenaline addiction, seemingly hooked on the daily rush of activity and firefighting within their organizations…The Quantification Bias: The benefits of becoming a healthy organization, as powerful as they are, are difficult to accurately quantify. What exactly is organizational health and how do I recognize it? A good way to recognize health is to look for the signs that indicate an organization has it. These include minimal politics and confusion, high degrees of morale and productivity, and very low turnover among good employees…And so a good way to look at organizational health -and one that executives seem to respond to readily— is to see it as the multiplier of intelligence. The healthier an organization is, the more of its intelligence it is able to tap into and use. Most organizations exploit only a fraction of the knowledge. experience, and intellectual capital that is available to them. But the healthy ones tap into almost all of it. That, as much as anything else, is why they have such an advantage over their unhealthy competitors. How do we create it, or get there? An organization doesn’t become healthy in a linear, tidy fashion. Like building a strong marriage or family, it’s a messy process that involves doing a few things at once, and it must be maintained on an ongoing basis in order to be preserved. Still, that messy process can be broken down into four simple disciplines: Discipline 1: Build a cohesive leadership team…Discipline 2: Create Clarity…Discipline 3…Overcommunicate Clarity…Discipline 4: Reinforce Clarity. A leadership team is a small group of people who are collectively responsible for achieving a common objective for their organization…This is perhaps the most important distinction between a working group and a real leadership team. Collective responsibility implies, more than anything else, selflessness and shared sacrifices from team members. Members of a truly cohesive team must trust one another. I realize that sounds like the most patently obvious statement ever made, something that every organization understands and values. As a result, you’d think that most leadership teams would be pretty good at building trust. As it turns out, they aren’t, and I think a big part of it is that they have the wrong idea about what trust is…The kind of trust that is necessary to build a great team is what I call vulnerability-based trust. This is what happens when members get to a point where they are completely comfortable being transparent. honest, and naked with one another, where they say and genuinely mean things like “I screwed up,” “I need help,” “Your idea is better than mine,” ‘T wish I could learn to do that as well as you do,” and even, “I’m sorry”…Trust is just one of five behaviors that cohesive teams must establish to build a healthy organization. However, it is by far the most important of the five because it is the foundation for the others. Simply stated, it makes teamwork possible. Only when teams build vulnerability-based trust do they put themselves in a position to embrace the other four behaviors, the next of which is the mastery of conflict. Even well-intentioned members of a team need to be held accountable if a team is going to stick to its decisions and accomplish its goals. In some cases, people will deviate from a plan or a decision knowingly, tempted to do something that is in their individual best interest but not that of the team. In other cases, people will stray without realizing it, getting distracted or caught up in the pushes and pulls of daily work. In either case, it’s the job of the team to call those people out and keep them in line…At its core, accountability is about having the courage to confront someone about their deficiencies and then to stand in the moment and deal with their reaction, which may not be pleasant. It is a selfless act, one rooted in a word that I don’t use lightly in a business book: love. To hold someone accountable is to care about them enough to risk having them blame you for pointing out their deficiencies. The ultimate point of building greater trust, conflict, commitment, and accountability is one thing: the achievement of results. That certainly seems obvious, but as it turns out, one of the greatest challenges to team success is the inattention to results. What would members of an executive team be focused on if not the results of their organization? Well, for one, the results of their department. Too many leaders seem to have a greater affinity for and loyalty to the department they lead rather than the team they’re a member of and the organization they are supposed to be collectively serving. Other distractions include a concern for individual career development, budget allocations, status, and ego, all of them common distractions that prevent teams from being obsessed with achieving results…The only way for a team to really be a team and to maximize its output is to ensure that everyone is focused on the same priorities— rowing in the same direction, if you will. The second requirement for building a healthy organization—creating clarity—is all about achieving alignment. This is a word that is used incessantly by leaders, consultants, and organizational theorists, and yet for all the attention it gets, real alignment remains frustratingly rare. Most executives who run organizations—and certainly the employees who work for them—will readily this. 1. Why do we exist? 2. How do we behave? 3. What do we do? 4. How will we succeed? 5. What is most important, right now? 6. Who must do what? If an organization’s reason for existence answers the Question, Why?, then its business definition answers the question. What? It’s critical that it be clear and straightforward. It should not be crafted so that it also be used in marketing material. The point is just to make sure that the leadership team is crystal clear about, and can accurately describe, the nature of the organization’s business so that they don’t create confusion within the rest of the company or, for that matter, in the market. It’s as simple as that. We came to realize that the best way for an organization to make strategy practical is to boil it down to three strategic anchors that will be used to inform every decision the organization makes and provide the filter or lens through which decisions must be evaluated to ensure consistency. Strategic anchors provide the context for all decision making and help companies avoid the temptation to make purely pragmatic and opportunistic decisions that so often end up diminishing a company’s plan for success. There is not a great deal to be said about this particular question, aside from warning leadership teams not to take it for granted. Although there is often clarity among executives in most organizations about who does what on the team, making assumptions about that clarity can lead to surprising and unnecessary problems. What those leaders fail to realize is that employees understand the need for repetition. They know that messaging is not so much an Intellectual process as an emotional one. Employees are not analyzing what leaders are saying based solely on whether it is intellectually novel or compelling, but more than anything else on whether they believe the leaders are serious, authentic, and committed to what they are saying. Again, that means repetition is a must. As important as overcommunication is, leaders of a healthy organization cannot always be around to remind employees about the company’s reason for existing, its values, and so on. In order to ensure that the answers to the six critical questions become embedded in the fabric of the organization, leaders must do everything they can to reinforce them structurally as well. The way to do that is to make sure that every human system every process that involves people—from hiring and people management to training and compensation, is designed to reinforce the answers to those questions. The challenge is to do this without adding too much structure. There is just no escaping the fact that the single biggest factor determining whether an organization is going to get healthier—or not—is the genuine commitment and active involvement of the person in charge. For a company, that’s the CEO. For a small business, it’s the owner. For a school, it’s the principal. For a church, it’s the pastor. For a department within a company, it’s the department head. At every step in the process, the leader must be out front, not as a cheerleader or a figurehead, but as an active, tenacious driver. At the end of the day, at the end of our careers, when we look back at the many initiatives that we poured ourselves into, few other activities will seem more worthy of our effort and more impactful on the lives of others, than making our organizations healthy. A recommended read in the area of organizational leadership and management. If you have not read The Five Dysfunctions of a Team, I highly recommend you read that one first. It is not the critic who counts; not the man who points out how the strong man stumbles, or where the doer of deeds could have done them better. The credit belongs to the man who is actually in the arena, whose face is marred by dust ally in the arena, whose face is marred by dust and sweat and blood; who strives valiantly; who errs, who comes short again and again. because there is no effort without error and shortcoming; but who does actually strive to do the deeds; who knows great enthusiasms, the great devotions; who spends himself in a worthy cause; who at the best knows in the end the triumph of high achievement, and who at the worst, if he fails, at least fails while daring greatly…. It is from this speech that Brené Brown, author of Daring Greatly, titled her book – on How the Courage to Be Vulnerable Transforms the Way We Live, Love and Lead. So what exactly is vulnerability, and why should we care about it? Everything I’ve learned from over a decade of research on vulnerability has taught me this exact lesson. Vulnerability is not knowing victory or defeat, it’s understanding the necessity of both; it’s engaging. It’s being all in. Vulnerability is not weakness since the uncertainty, risk, and emotional exposure we face every day are not optional. Our only choice is a question of engagement. Our willingness to own and engage with our vulnerability determines the depth of our courage and the clarity of our purpose; the level to which we protect ourselves from being vulnerable is a measure of our fear and disconnection. When we spend our lives waiting until we’re perfect or bulletproof before we walk into the arena, we ultimately sacrifice relationships and opportunities that may not be recoverable, we squander our precious time, and we turn our backs on our gifts, those unique contributions that: only we can make. Wholehearted living is about engaging in our lives from a place of worthiness. It means cultivating the courage, compassion, and connection to wake up in the morning and think, No matter what gets done and how much is left undone, I am enough. It’s going to bed at night thinking. Yes, I am imperfect and vulnerable and sometimes afraid, but that doesn’t change the truth that I am also brave and worthy of love and belonging. The three forms of shielding that I am about to introduce are what I refer to as the “common vulnerability arsenal” because I have found that we all incorporate them into our personal armor in some way. These include foreboding joy, or the paradoxical dread that clamps down on momentary joyfulness; perfectionism, or believing that doing everything perfectly means you’ll never feel shame; and numbing, the embrace of whatever deadens the pain of discomfort and pain. Practicing Gratitude: 1. Joy comes to us in moments—ordinary moments. We risk missing out on joy when we get too busy chasing down the extraordinary. 2. Be grateful for what you have. 3. Don’t squander joy. Setting Boundaries Finding True Comfort and Cultivating Spirit: Learning how to actually feel their feelings. Staying mindful about numbing behaviors (they struggled too). Learning how to lean into the discomfort of hard emotions. Trust is a product of vulnerability that grows over time and requires work, attention, and full engagement. Trust isn’t a grand gesture—it’s a growing marble collection. We cultivate love when we allow our most vulnerable and powerful selves to be deeply seen and known, and when we honor the spiritual connection that grows from that offering with trust, respect, kindness, and affection. Love is not something we give or get; it is something that we nurture and grow. A connection that can only be cultivated between two people when it exists within each one of them—we can only love others as much as we love ourselves. Shame, blame, disrespect, betrayal. and the withholding of affection damage the roots from which love grows. Love can only survive these injuries if they are acknowledged. healed, and rare. Vulnerability sounds like truth and feels like courage. Truth and courage aren’t always comfortable, but they’re never weakness. Yes, we are totally exposed when we are vulnerable. Yes, we are in the torture chamber that we call uncertainty. And, yes, we’re taking a huge emotional risk when we allow ourselves to be vulnerable. But there’s no equation where taking risks, braving uncertainty, and opening ourselves up to emotional exposure equals weakness. 1. Recognizing Shame and Understanding Its Triggers. Shame is biology and biography. Can you physically recognize when you’re in the grips of shame, feel your way through it, and figure out what messages and expectations triggered it? 3. Reaching Out. Are you owning and sharing your story? We can’t experience empathy if we’re not connecting. 4. Speaking Shame. Are you talking about how you feel and asking for what you need when you feel shame? Nothing has transformed my life more than realizing that it’s a waste of time to evaluate my worthiness by weighing the reaction of the people in the stands. The people who love me and will be there regardless of the outcome are within arm’s reach. This realization changed everything. That’s the wife and mother and friend that I now strive to be. I want our home to be a place where we can be our bravest selves and our most fearful selves. Where we practice difficult conversations and share our shaming moments from school and work. I want to look at Steve and my kids and say, “I’m with you. In the arena. And when we fail, we’ll fail together, while daring greatly.” We simply can’t learn to be more vulnerable and courageous on our own. Sometimes our first and greatest dare is asking for support. When we stop caring about what people think, we lose our capacity for connection. When we become defined by what people think, we lose our willingness to be vulnerable. If we dismiss all the criticism, we lose out on important feedback, but if we subject ourselves to the hatefulness, our spirits get crushed. It’s a tightrope, shame resilience is the balance bar, and the safety net below is the one or two people in our lives who can help us reality-check the criticism and cynicism. My corporate talks almost always focus on inspired leadership or creativity and innovation. The most significant problems that everyone from C-level executives to the front-line folks talk to me about stem from disengagement, the lack of feedback, the fear of staying relevant amid rapid change. and the need for clarity of purpose. If we want to reignite innovation and passion, we have to rehumanize work. When shame becomes a management style, engagement dies. When failure is not an option we can forget about learning, creativity, and innovation…Shame can only rise so far in any system before people disengage to protect themselves. When we’re disengaged, we don’t show up, we don’t contribute, and we stop caring. 1. Shame: Is fear of ridicule and belittling used to manage people and/or to keep people in line? Is self-worth tied to achievement, productivity, or compliance? Are blaming and finger-pointing norms? Are put-downs and name-calling rampant? What about favoritism? Is perfectionism an issue? 2. Comparison: Healthy competition can be beneficial, but is there constant overt or covert comparing and ranking? Has creativity been suffocated? Are people held to one narrow standard rather than acknowledged for their unique gifts and contributions? Is there an ideal way of being or one form of talent that is used as measurement of everyone else’s worth? 3. Disengagement: Are people afraid to take risks or try new things? Is it easier to stay quiet than to share stories, experiences, and ideas? Does it feel as if no one is really paying attention or listening? Is everyone struggling to be seen and heard? Vulnerability is at the heart of the feedback process. This is true whether we give, receive, or solicit feedback. And the vulnerability doesn’t go away even if we’re trained and experienced in offering and give us the advantage of knowing that we can survive the exposure and uncertainty, and that it’s worth the risk. The space between our practiced values (what we’re actually doing, thinking, and feeling) and our aspirational values (what we want to do, think, and feel) is the value gap, or what I call “the disengagement divide.” It’s where we lose our employees, our clients, our students, our teachers, our congregations, and even our own children. We can take big steps—we can even make a running jump to cross the widening value fissures that we face at home, work, and school—but at some point, when that divide broadens to a certain critical degree we’re goners. That’s why dehumanizing cultures foster the highest levels of disengagement—they create value gaps that actual humans can’t hope to successfully navigate. Who we are and how we engage with the world are much stronger predictors of how our children will do than what we know about parenting. Perfect and bulletproof are seductive. but they don’t exist in the human experience. We must walk into the arena, whatever it may be—a new relationship, an important meeting, our creative process, or a difficult family conversation—with courage and the willingness to engage. Rather than sitting on the sidelines and hurling judgment and advice, we must dare to show up and let ourselves be seen. This is vulnerability. This is daring greatly. I would highly recommend this bestselling book, as well as the associated TED talk, which ranks as one of the most watched of all times. I recently read Profiles In Courage by John F. Kennedy. 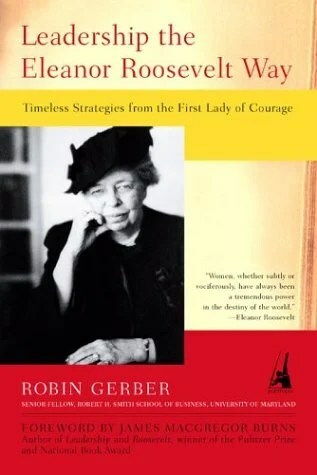 I recently finished reading Leadership The Roosevelt Way – Timeless Strategies from the First Lady of Courage by Senior Scholar Robin Gerber. What sets this book apart is the structure, the selection of supporting biographical elements and the summary of the key lessons at the end of each chapter. A must read Leadership book!